The Poor Fellow-Soldiers of Christ and of the Temple of Solomon also known as the Knights Templar were, in their day, one of the most prominent, wealthy, and powerful of military orders in Europe and were a model for other orders to follow. This series will cover the Knights Templar's legendary origins, their early years, their growth, their famous and infamous battles over the centuries, their tragic end at the hands of the French monarchy, and the continuation theories that have surrounded them. This year marks the 900th anniversary since the founding of this knighthood of warrior-monks. In this article I will discuss the fall of the Roman Empire, the rise of Islam, Muslim control of the Holy Land, the spread of Islam, Muslim incursion into Byzantine land, the rise of the Holy Roman Empire, the split of Christianity: Roman Catholic versus Greek Orthodox, Byzantium's cry for help and Rome's response, the Crusader's journey to the Holy Land, the First Crusade, the founding of the Latin Kingdom of Jerusalem, Hugh de Payen and the founding of the Knights Templar, St. Bernard of Clairvaux and the Cistercian Order, and the Templar origin stories. This article is the first part of a five-part series. By the time of the 5th century, the Roman Empire was plagued with poor and divided leadership, dwindling population, and, having expanded too much, couldn't protect its own borders. The Roman Empire declined to such a point that it would be besieged and then sacked by the Visigoth's in 410 AD. Looking back at history, Diocletian had declared in 285 AD, that Maximian, a friend, would serve as "co-emperor" (or Augustus) with him to better control the vast empire which was still considered a single entity, not two. Each Emperor would have his own court, military, and administration. Below them were created two Caesars, which would be lesser Emperor's to the Augusti, and was a system referred to as the Tetrarchy (or Leadership of Four). This system would last only a few years until it was reunified under Constantine the Great, but then would be split again after the death of Constantine. While it was claimed that this split would not divide the Empire, it did. The Latin, or Western, Empire (referred to as the Roman Empire) relied heavily on the Greek, or Eastern Empire (referred to as the Byzantine Empire), for trade and supplies so when it was divided the West did lose out on a great deal of the luxuries enjoyed in the Eastern province. In the Western Roman Empire, civil wars ensued, incursions on the borders of the Empire, and disease started weakening the Empire. Due to the shrinking population, the Roman armies started hiring barbarians as mercenaries who held no loyalty to the Empire, and by their treatment, they really didn't need to give any. The Empire became so dependent on them that their defenses were basically gone and Rome was ripe for the taking. Soon the fallen empire was constantly being invaded by Saxons, Britains, Franks, Vandals, Goths, and so forth. Rome was shattered into a thousand pieces. In the midst of this chaotic period of doom and gloom, there was a glue that kept much of Europe united, and that was Christianity. 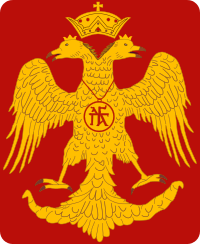 While the Western Roman Empire crumbled and gave way to the Dark Ages, the Eastern Roman Empire continued to thrive. Zeno, Emperor of the Eastern Roman Empire, declared that the Empire would be united again under one Emperor and he attempted to negotiate with the invading Ostrogoths, but invasions and internal disputes prevented him and his successors from successfully reconquering the Western regions of the Empire. When Emperor Justinian I took the throne in 527 AD, he secured peace with the Persians in the East turned his attention to restoring Imperial control over the lost Western Roman Empire. By the time of Justinian's death in 565 AD, he had partially regained much of the lost territory and it is said that the Mediterranean Sea was again a "Roman Lake." Yet, while the Byzantine Emperor was attempting to expand the boundaries and ensure the future stability of the Empire, in Mecca a man was born that would change the geopolitics of the Middle East which would play a significant factor for the Crusades. Justinian I, Emperor of the Byzantines from 525 AD to 565 AD, was one who made great attempts to restore the greatness of the Roman Empire. Through his ambition, the Byzantine pushed back the Ostrogoths and took back much of the territory of the former Roman Empire and made the Mediterranean a "Roman Lake" again for a short time. Under his reign, the Byzantine culture blossomed and flourished to include the building of the Hagia Sophia (meaning "Holy Wisdom") which is an architectural marvel and is said to have changed the face of architecture. This building would serve as a Patriarchal cathedral for the Greek Orthodox, an imperial mosque under the Ottoman Empire, and now currently as a museum. While the chaotic Western world was uniting under Christianity, Islam was taking root in the Middle East. The Muslim Prophet Muhammed was born in Mecca around 570 AD. Tradition says that he was a humble man who would often go to the surrounding mountains and recluse himself in caves for reflection. Though he was spent some time by himself, he wasn't a hermit, but by profession was a merchant and while on a trading trip it is said that he met a Christian monk named Bahira who said that Muhammed was going to chosen by God as one of His Prophets. At the age of 40, Muhammed, during one of his cave reflections, was said to have been visited by the Archangel Gabriel and received a revelation from God. Muhammed preached privately and converted only a few at first, but soon began to preach openly which was accepted in some places, but he met with fierce resistance. After many years of fighting, most of the Arabian peninsula had converted to Islam. In 632 AD, the Muslim Prophet Muhammed died in Medina. The Middle East had long been a region stuck between two empires and which were filled with many pagan religions and beliefs, but now the people of this region were united into a single religious polity that would reshape the future, even to the modern day. Islam was established along major trade routes which allowed it to spread quickly to other regions of the world. Following the death of the Muslim Prophet, the Muslim world would be led by a series of Caliphs (an Islamic leader) who greatly expanded the boundaries of Islam and these burgeoning Caliphates. These Caliphates were able to start conquering lands disputed between the Byzantines and the Persians as both of those powers were weakened by the continuous warring with each other. By the time the Rashidun Caliphate ended in 661 AD, nearly the entire Middle East and much of Persia was under Islamic rule. Under the Umayyad Caliphate, Islam began to spread to North Africa. The Byzantines owned many cities along North Africa, but by the end of the 7th century the Umayyad Caliphate had conquered and taken over this region to include several islands in the Mediterranean and Aegean Seas. It's astounding to see the rapid spread of Islam. Not all of it was through conquest; for example, Syrians and Egyptians were much more willing to convert and submit to Islam as they felt alienated by the Byzantines who were constantly attempting to impose their religious beliefs onto them. Some converted simply because it was financially convenient and they didn't want to go through the imposition of being taxed as a non-Muslim (as Jews and Christian were). Muslims had captured Jerusalem in 638 AD. The Patriarch of Jerusalem, Sophronius, agreed to surrender the city to only the Caliph himself. In a city dominated by Christians and Jews, the Muslim rulers constructed the Dome of the Rock as a counterbalance to the Church of the Holy Sepulchre. The Dome of the Rock is the oldest existing Islamic monument in the world and for most still the greatest. The Church of the Holy Sepulchre was spared destruction until 1099 when the Fatimid Caliph had over 2,000 churches destroyed throughout the empire to include the Church of the Holy Sepulchre, but it was later rebuilt. To this point, no serious conflict had arisen between Christianity and Islam as both religions had flourished in different parts of the world, but soon that would all change. Not satisfied with their recent conquests in the Middle East and North Africa, the Caliphate crossed the Straits of Gibraltar. The Muslim invaders moved into the Iberian peninsula (now Spain) and destroyed the Visigothic kingdom and established the independent Emirate of Cordova. Seeing the Franks as an easy target and soon an army of 50,000 led by General Abdul Rahman al-Rafiki crossed the Pyrenees into France. Initially, the Muslims were successful in their conquest and at the River Garonne, it is said that only God knows how many Franks were slain. The Muslim invaders would have continued had it not been for the leadership of Charles Martel who was able to amass an army and stop the Islamic expansion. The Battle of Tours occurred on October 10th, 732, between the Frankish army (between 15,000 and 75,000) led by Charles Martel and the Islamic army (between 60,000 and 400,000) led by General Abdul Rahman al-Rafiki. This battle resulted in a major defeat and retreat of the Islamic army, the death of Abdul Rahman, and the preserving Christianity as the controlling faith in Europe. From this battle, Charles Martel earned the nickname "Charles the Hammer" who continued to push Islamic forces from France over the years. Charles Martel was a brilliant tactician and leader which allowed him to repel armies of superior numbers and weaponry. The armored cavalry was born out of these battles which would form the backbone of Western warfare for the next several centuries. His son and grandson, Charlemagne, helped fortify the border between Spain and France that would assist in the Reconquista of Spain later on. While the expansion of Islam didn't take hold in Europe outside of the Iberian peninsula, Islam was the controlling religion in Jerusalem, Alexandria, and Antioch (three former Christian Patriarchates). The Mediterranean Sea would be the dividing line for most of the territories controlled by the two religions. 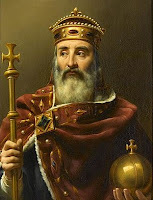 After the death of his father, Pepin, Charlemagne ascended the Frankish throne as King in 768 AD. Charlemagne further expanded what his father and grandfather had done; by 774 AD, Charlemagne had removed the Lombards from power and took the title of King of Italy. On Christmas Day in 800 AD in St. Peter's Basilica in Rome, Pope Leo III crowned Charlemagne as Emperor, the first one recognized since the fall of the Roman Empire. Charlemagne's reign is noted for his expansion of the Carolingian Empire, the support of the Christian religion, and intellectual growth. Due to his efforts to unite Europe under a single power, Charlemagne is known as the "Father of Europe." Charlemagne held the position of Emperor until his death in 814 AD. His successors would keep the title until 924 AD when the last of the Carolingian dynasty died. Otto I would revive the title in 962 AD when he was crowned Holy Roman Emperor by Pope John XII, which some claim is the founding date of the Holy Roman Empire and not 800 AD with Charlemagne. While the rise of Imperial power in Western Europe. Otto is remembered for his strengthening and solidifying of the Germans states. The establishment of an Emperor by the Pope would play a role in the Great Schism of 1054. Also called the "East-West Schism", this event is dated to when Pope Leo IX and Patriarch Michael I of Constantinople excommunicated each other. The primary cause of this schism was the dispute over the authority of the Bishop of Rome, today is known as the Pope. Since the earliest days of organized Christianity, there were three special positions recognized: the Bishop of Rome, the Bishop of Alexandria, and the Bishop of Antioch. Two more were added later on and confirmed at the Council of Chalcedon in 451, they were the Bishop of Constantinople and the Bishop of Jerusalem. These five Bishops were also called Patriarchs. These five Bishops were said to hold authority and precedence over their fellow bishops in the Catholic Church with the Bishop of Rome being first among equals as he is said to be the successor of St. Peter. With the fall of the Western Roman Empire and the continuation of the Eastern Byzantine Empire, the Bishops of Rome focused more on Western Europe and communication with their four Eastern counterparts dwindled. Eastern Christianity and the Byzantine Empire spoke Greek rather than Latin so the growing divide was not just geopolitical, but also linguistic and cultural. The bickering between these five Patriarchs led to an exchange of excommunications in 1054 by Leo IX in Rome and Michael I in Constantinople, and the official separation of the Roman Catholic Church and the Orthodox churches. While this schism officially occurred in 1054, this schism had been growing for decades. These excommunications would last until 1965 when Pope Paul VI and Patriarch Athenagoras I presided over simultaneous ceremonies that revoked the excommunication decrees. The Seljuk Turks, a group of nomadic Turkish warriors from Central Asia, during the conquests of Persia and the Middle East, had embraced Islam. It is said they came out of what would be now northern Iran and conquered Persia before moving west. They captured Baghdad in 1055, Jerusalem in 1070, and then started invading into Anatolia (Turkey) into the territory of the Byzantine empire. In 1071, the Seljuk Turks defeated the Byzantines at the Battle of Manzikert which led to the capture of Byzantine Emperor, Romanus IV Diogenes, and laid the way for further invasions into Byzantine territory. Control of the entire peninsula didn't happen overnight. It took over 20-years for the Turks to fully control the entire Anatolian peninsula, but they didn't hold it for long. The Seljuks didn't just attack the Byzantine's either. They also fought against the Fatimid Caliphate out of Egypt and eventually captured Jerusalem in 1077; the Seljuk Turks were Sunni Muslim and the Fatimids were Shia Muslim. This event is considered the catalyst for the crusades as during Fatimid control, Christians could still go on pilgrimages to Jerusalem, but under Seljuk rule, Christians were prevented from entering Jerusalem and completing their pilgrimage. Romanus's successor and stepson, Emperor Michael VII Ducas, sought the aid of Pope Gregory VII, who considered leading a military expedition to drive back the Turks, recover the Holy Sepulchre, and restore Christian unity following the de facto breach that had occurred with Eastern Christendom in 1054. Pope Gregory VII greatly desired to restore the relationship between the Latin and Greek Christians, but due to his conflicts with Henry IV, Holy Roman Emperor, he was deposed and died in exile. The papacy of Victor III was short and soon Pope Urban II would be elected as the Vicar of Christ in 1088. It is important to note that around 1090, St. Bernard of Clairvaux was born in southeastern France. During this time, the Byzantine Empire had passed to the hands of Alexios I Komnenos, who still sought help from the West, sent a plea to Pope Urban II in 1095. Since Michael VII's plea, the Seljuk Turks had also captured the city of Antioch (1084) and Nicaea (1092); two famous ecumenical councils had been held in these cities centuries before. In November of 1095, Pope Urban II convened the Council of Clermont in southern France. This council was attended by more than just clergy, but also by the nobility, knights, and common folk alike. In western Europe, there had been so much infighting that Pope Urban II saw a way to establish peace and order as well as recapture the Holy Land under Christian rule. He, therefore, urged the masses to unite in defense of their fellow Eastern Christians and to move on the Holy Land. The Pope also promised plenary indulgence to those who would undertake this journey. 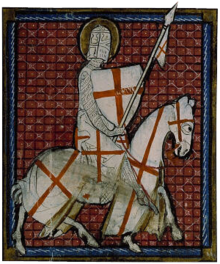 The first of the crusader armies left France around mid-August of 1096 and headed for Constantinople. It is thought that the Emperor Alexios was expecting a small contingent of knights to assist in defeating the Seljuk Turks, but instead, a massive Western European host arrives at the steps of Constantinople. This host was really four armies composed of French, Normans, and Germans, each with their own commanders but the most notable was the Duke Godfrey de Boullion. Alexios met with the leaders, but not wanting a restless army around his city sent the armies into Anatolia with the order that the land they conquered would be returned to the Byzantine Empire. In June of 1097, Nicaea was captured and return to Byzantine control followed by a victory at Dorylaeum. When the Crusaders asked help from the Emperor Alexios, he balked at their request. The crusaders considered this a breaking of the promise between each other and they would no longer return the land to the Byzantines. In June of 1099, the city of Antioch was retaken and controlled by the Normans. In July of 1099, the crusading armies arrived at and surrounded Jerusalem; the Fatimid Caliphate had retaken Jerusalem from the Seljuk Turks in the summer of 1098. On July 15th, 1099, some were able to get over the walls and open up the main gate allowing in the main force. In the Tower of David, the Fatimid governor surrendered and was escorted from the city. What followed was a massacre of Muslim, Jew, and Christian inhabitant alike. Then the mosques to include the Dome of the Rock were all converted to Christian churches. Even though much of the Holy Land was still under Muslim control, once Jerusalem was taken many of the crusaders started for home as they saw their goal had been achieved. Two weeks after Jerusalem fell to the crusaders, Pope Urban II died and Paschal II took over the papacy. In the wake of the crusade, four Christian states were established in the captured territories: the Latin Kingdom of Jerusalem, the Principality of Antioch, the County of Edessa, and the County of Tripoli. The geopolitics was very complex as now the region was filled with Fatimid Muslims, Seljuk Turks, Byzantines, and the new crusader kingdom. The need for a strong defense of these new Christian states gave rise to the variety of religious orders of knighthood. These Christian states would begin to flourish and eventually, they expanded their control of the coastal cities and into what is now Syria, Jordan, Sinai, Lebanon, and Egypt. The Latin Kingdom of Jerusalem came about after a council was held on July 22, 1099, to select a king. There were two primary contenders for the position: Raymond IV of Toulouse and Godfrey de Bouillon. Raymond was the wealthier and more powerful of the two, but, upon being asked, refused the title of king. The council turned to Godfrey who did not refuse and thus became the first King. Godfrey would expand his kingdom by capturing more and more cities such as Jaffa (Tel Aviv today), Galilee, and Haifa. Much of the day to day running of Jerusalem had been turned over to the Patriarch of Jerusalem, Daimbert of Pisa, who sought to establish a theocratic government that would fall under the Papacy. Godfrey's reign was successful but short. He died in 1100 AD from an illness and the crown passed to his brother, Baldwin. Baldwin took the title of "King of the Latins of Jerusalem" and set the foundation of a secular state rather than a theocratic one. 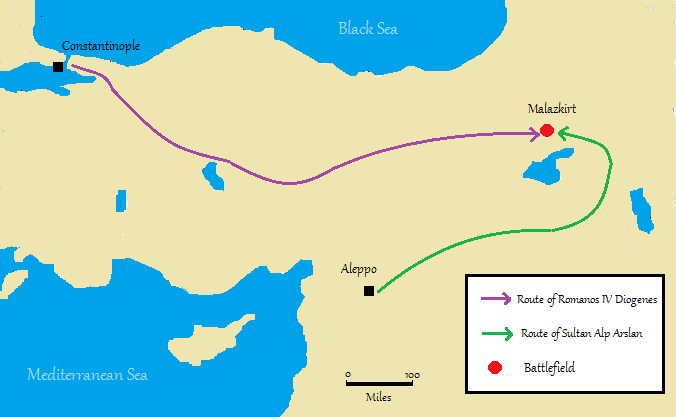 Baldwin continued the expansion of the Latin Kingdom, capturing Acre, Beirut, and Sidon. He also fought back against the Fatimids who were attempting to recapture their lost land. While Godfrey was the first king, many say it was Baldwin I who established the true kingdom into a solid feudal state. Baldwin I died without an heir in 1118 while on a campaign against the Fatimids. The crown was offered to his brother Eustace, but he turned it down. The crown passed to Baldwin de le Bourg, most likely a cousin, who was afterward known as Baldwin II and would play a very important role in the establishment of the Knights Templar. As was mentioned in the article on Hugh de Payens, it is impossible to say whether or not Hugh de Payens took part in the First Crusade. It is known that Hugh de Payens traveled back and forth between France and Jerusalem several times. in 1114, he, along with a contingent of knights, entered the service of the Holy Sepulchre Canon to defend and protect pilgrims traveling to Jerusalem. Eventually, he and a number of other knights would form a new order and approach King Baldwin II. This order was recognized by King Baldwin II and the Patriarch of Jerusalem at the Council of Nablus in 1120. 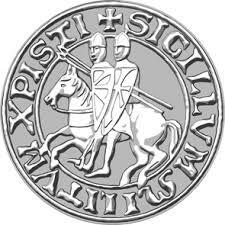 Both of them donated lands to the knights; of the most importance, King Baldwin II gave the knights the residence within stables at King Solomon's Temple from which they took the name "Poor Knights of Christ and the Temple of Solomon" or Knights Templar. This article I briefly discussed the fall of the Roman Empire, the continuation of the Byzantine Empire, the rise and expansion of the Islamic faith, the Holy Roman Empire, the Great Schism, the conflicts of Islam and Christianity, the First Crusade, and the formation of the Knights Templar. Part 2 will cover the rest of the 12th century, Part 3 the 13th century, Part 4 the 14th century and suppression of the Knights Templar, and Part 5 will go over the many myths and theories of the Knights Templar after their dissolution.